I found this Hot Wheels 2006 Mainline series VW Bug in a Value Village toy car grab bag on Saturday. This particular Larry Wood VW Bug casting first appeared in 1989 just a couple of years after I stopped collecting Hot Wheels cars as a kid, which is a shame. I’ve always loved the Volkswagen Beetle and this casting, while not entirely realistic, is still about the straightest version of the Beetle that has ever appeared as a Hot Wheels mainline (even if the wheels are proportionally much too big compared to the real thing). 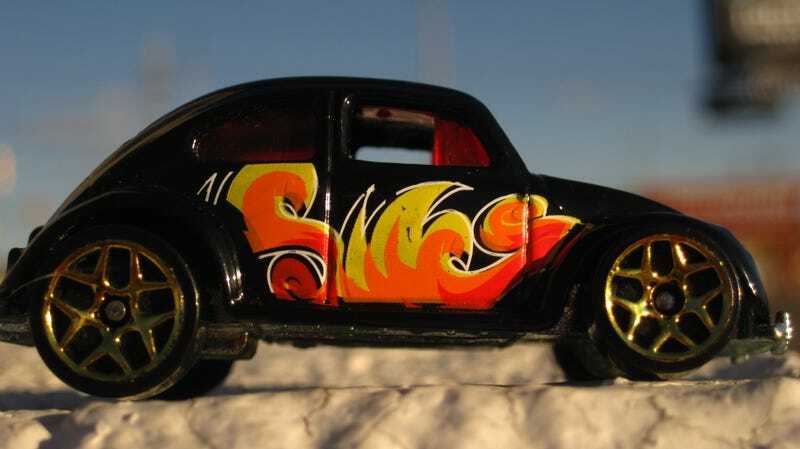 The only Hot Wheels Volkswagen Beetle casting that was made regularly when I was a kid was the Baja Beetle, a casting that I very much like, but even as a kid I knew it was like a Beetle on steroids. I wouldn’t say I was ever a big fan of Y5 rims on Hot Wheels cars since I grew up in the “Blackwall” era and prefer rims that don’t go almost all of the way to the edge. Weirdly, they kind of work on this Beetle, maybe not so much for the style of the rims but rather because the gold chrome compliments the black, orange, and yellow. I rather wish I had taken photos of this car from a few more angles, but it was late in the afternoon and it was more complicated getting angles where the camera and the photographer wasn’t casting a shadow on the car, and I had a hard time getting the auto macro lens to focus correctly using any degree of zoom. I got a few nice shots, so I’m happy. Wagon Wednesday: a Majorette Mercedes-Benz 300 TE. Hot Wheels Porsche series Porsche 917 and a vintage Blackwall friend.